In little less than 10 months, Colombia has witnessed the creation of a completely new jurisdiction, among an intense political debate surrounding its legitimacy, principles, and scope. During its first year, the Special Jurisdiction for Peace (JEP) has already opened two cases and three situations in its Chamber for the Acknowledgment of Truth and Responsibility, which is in charge of handling crimes deemed the most serious, representative, and to have decisive participation of specific actors. This chamber’s method for selecting and prioritizing cases includes the vital participation of victims, their organizations, and other Colombian civil society organizations via the submission of reports. A participation mechanism, such as the one designed by the negotiating parties in Havana, is unparalleled, and it is one of the ways in which a victim-centered approach is evident in the Comprehensive System of Truth, Reparation and Non-repetition. Today, victims in Colombia can be real protagonists of the JEP since the very first stages of the process. Through the elaboration of thorough reports, civil society members have collaborated in the building of macro-cases, contributing both their input and an analysis of the complex contexts in which these atrocities were committed. Each and every case and situation prioritized in the Chamber for the Acknowledgment of Truth and Responsibility includes thousands of victims, rigorous context evaluations, and dozens of alleged perpetrators who were operating under a plan, practice, or policy. Solving these cases can provide justice and contribute to truth-seeking faster and more effectively than a regular justice system could. Additionally, the JEP has produced a very important number of decisions, which have built jurisprudence that contributes to guiding this task going forward. That being said, the political context, and especially considering the long wait that victims have endured to obtain justice, calls for effective sanctions—whether restorative or retributive—for those who participated in the most serious and representative cases. In a country with a legalistic tradition such as Colombia's, there is always the risk of excessive procedural ritualism. Victims did not begin demanding justice only when the JEP was created. They have been waiting for years for an effective answer from the state, in terms of elucidation of the facts, identification of those responsible, and convictions. Likewise, the responsible parties expect the jurisdiction to act efficiently and in compliance with due process, in line with their commitment to victims' rights. Processes of adaptation and institutional consolidation, which are permanently happening in a jurisdiction that is constantly reinventing itself, must work to facilitate effective decision-making. 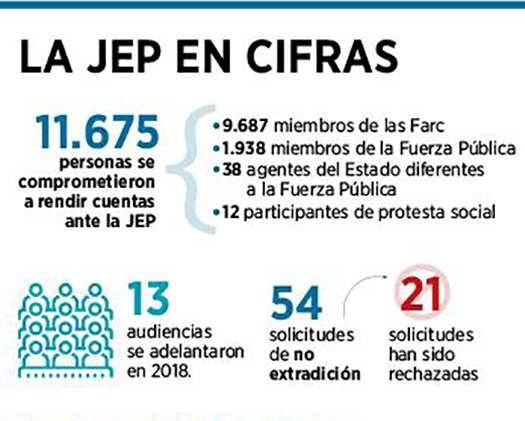 At the end of the day, both victims and the Colombian society will evaluate the JEP not for the efforts it makes but for the tangible results it manages to deliver.